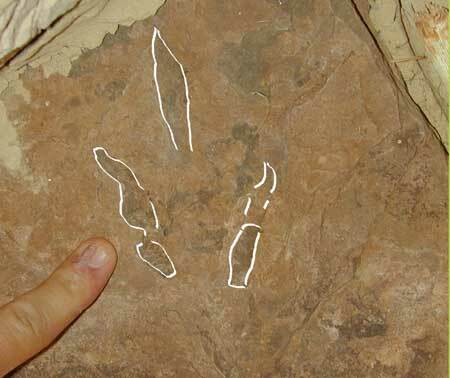 Scientists searching for fossils in southern Utah have found that they certainly weren’t the first to prize the traces left behind by dinosaurs. While on a break from a fossil hunt in Utah’s San Juan County, paleontologists explored a stone structure that had been built under a cliff overhang at least 800 years ago. 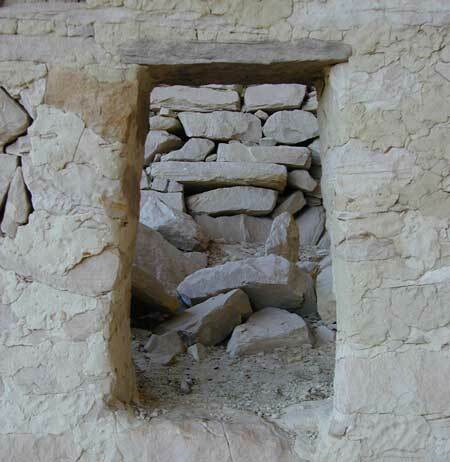 While most of the building had been made from cream-colored sandstone found nearby, one piece stood out — the pinkish rock that formed the lintel over the doorway. It was covered in the fossilized tracks of a theropod dinosaur. “The slab with the fossilized track appears to have been transported here from another location and then deliberately placed as the lintel in this structure by the builders,” writes paleontologist Joshua Smith, who reported his discovery today with his colleagues at a meeting of geologists in Denver. In an interview, Smith explained that he stumbled upon the find in 2003, while taking time out from a paleontological excavation in southeastern Utah. “We were excavating a new genus and species of dinosaur from the Early Jurassic Navajo Sandstone,” Smith told Western Digs. The cliff dwelling is well-known to archaeologists, but the dinosaur tracks — and the fact that the lintel was a different kind of rock than the rest of the building — had gone unnoticed. “It appear there are two tracks on the lintel, one fainter than the other,” Smith said. The structure is a small dwelling that was built and occupied over several phases of Ancestral Puebloan history, he said. Parts of the structure date back to the early phase known as Basketmaker II, when Ancestral Puebloans began to experiment with agriculture and build permanent settlements, starting about 2,500 years ago. But most of the house’s construction seems to have taken place more recently, during the Pueblo III period, from about 1150 to 1350. 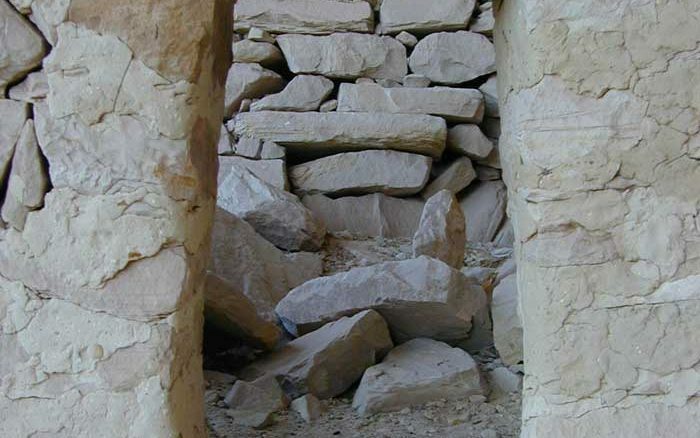 The placement of the track-marked rock appears to be intentional, Smith added, because the dark pink stone, while local, is from a different deposit than the source of the rest of the building stone. This is the first known instance of dinosaur tracks being incorporated in pre-contact architecture in the Southwest, Smith added. Fossilized tracks are known as ichnofossils, and it’s difficult if not impossible to know which species made a given set of tracks. But paleontologists have a separate system for classifying tracks, Smith explained. “Tracks are defined, described, and assigned to an ichnogenus, the same as organisms are assigned to a genus and species,” he said. 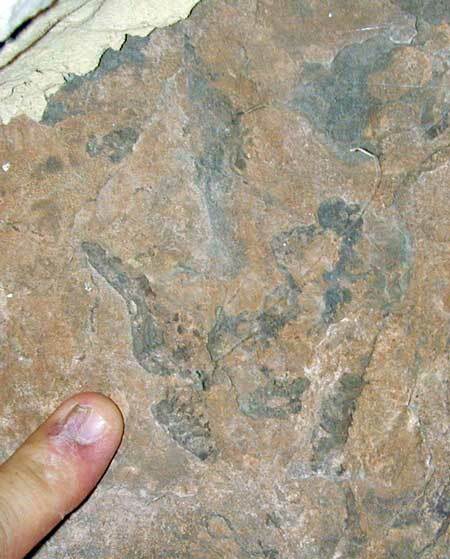 The three-toed tracks in the Ancestral Puebloan house appear to be a type known as Grallator — the calling card of small carnivores like Coelophysis, a theropod that reached up to three meters in length, Smith said. Based on the type of rock they’re found in, the tracks were likely made by a dinosaur that traipsed through a muddy riverbed at least 200 million years ago. The question that remains, of course, is why Ancestral Puebloan masons went out of their way to place this rock above the entryway to this house. Smith and his colleagues intend to investigate what meaning such tracks and other fossils might have had for the indigenous peoples of the Southwest, he said. For now, however, that meaning remains unknown. “What significance they placed on them is a mystery,” Smith said of the fossils. Smith and his colleagues reported their findings at the annual meeting of the Geological Society of America in Denver, Colorado.